We ensure our clients embrace an "open source" philosophy and accept that we actively share all (non-confidential) insights and methodologies. Hystra identifies issue areas that a single player cannot tackle alone, bringing together consortiums of public, business and citizen sector players to research these issues. We start with a global scan of innovations in the field, we identify those that actually work (socially, economically, and environmentally) and analyze the obstacles that prevent them from reaching scale. We then propose a set of actions for the various types of organizations that can play a role in overcoming these obstacles (large corporations, NGOs, aid agencies, etc. ), to catalyze change in the sector. These analyses and recommendations are presented in reports that are made available according to our open source philosophy. Based on an in-depth analysis of 12 projects, Hystra provides recommendations for two promising sanitation models for the BoP: projects that facilitate the creation of a local, sanitation market in rural areas and enterprises servicing home mobile toilets in urban areas. A Report for the Toilet Board Coalition, sponsored by AFD, DFID, Kimberly-Clark, the Stone Family Foundation, and Unilever. Based on a global research of 7 best practice organizations selling nutrition products for 6-24 month old infants (i.e. complementary foods and supplements) to the BoP, Hystra designed a report with 8 key lessons learned for marketing, selling and distributing nutrition products. In partnership with the Global Alliance for Improved Nutrition. Based on 15 case studies, Hystra designed a report with 10 key lessons learnt for distributors of durable goods targeted towards the BoP. In partnership with the Bill & Melinda Gates Foundation, the Children's Investment Fund Foundation and the Shell Foundation. This report shows how pioneer companies and organizations have sustainably increased the income and livelihoods of millions of smallholder farmers around the world, by sourcing produce from them or selling products to them. This report emphasizes smallholder farmers’ role as active partners rather than aid recipients by comparing the performance of 15 successful organizations worldwide. 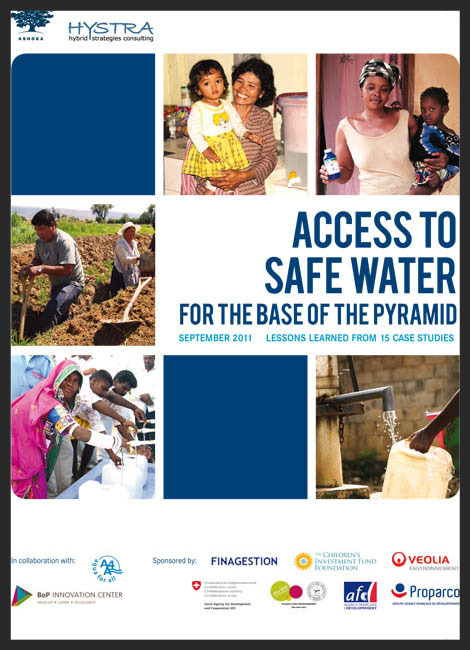 Based on the analysis of 19 detailed case studies, Hystra designed and published a practitioner's guide laying out how private and public sector players can capture opportunities to provide access to water for the BoP. In partnership with AFD, Aqua for all, BoP Innovation Center, the Children's Investment Fund Foundation, Finagestion, Proparco, SDC, Suez Environnement and Veolia. Based on the analysis of 15 detailed case studies, Hystra designed and published a practitioner's guide laying out how private and public sector players can capture opportunities to leverage ICT for the BoP in education, health, agriculture and financial services. In partnership with AFD, Ericsson, ICCO, Orange and TNO. Based on the analysis of 20 detailed case studies, Hystra designed and published a practitioner's guide laying out how private and public sector players can capture opportunities to provide access to energy to the BoP. In partnership with GDF Suez, Schneider Electric and Total. Based on a global research of 22 innovative Inclusive Business models providing Affordable Housing to the BoP, we - working in partnership with Ashoka - designed a toolbox to help our client executives design a BoP business model, starting with selecting a target segment to making design choices throughout the value chain, from financing though to access to land & services. This 68 pages step-by-step manual was then used by our client in building pilots in half a dozen developing countries. In 2011, we updated and complemented this research and presented it in Ashoka's Housing For All summit.